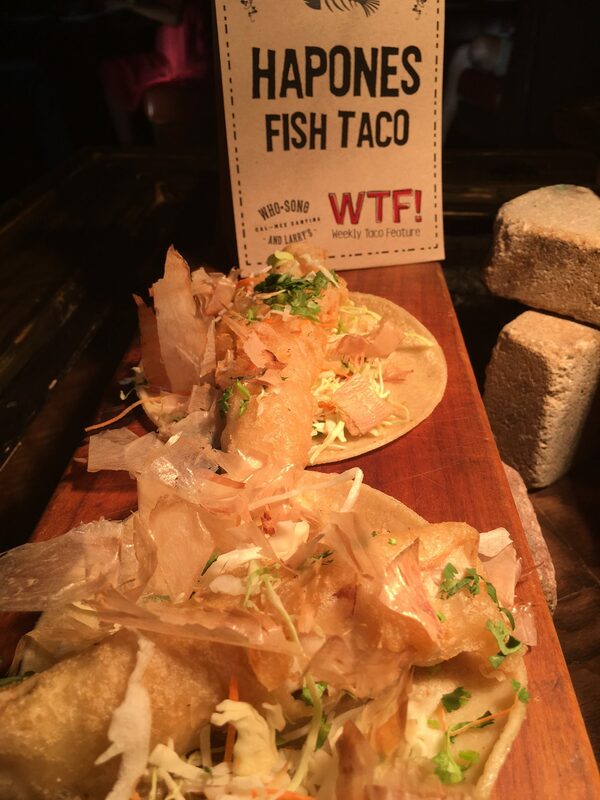 We recently had the chance to attend Who Song & Larry’s in Orange for their Weekly Taco Feature or “Wednesday, Thursday, Friday” also known as WTF. We know what you were thinking, but we’re a family blog site, and we keep it clean. Remember we love taco’s, so it was a perfect fit! It’s a very fun promotion with two new taco features introduced weekly at Who Song & Larry’s. A familiar chef favorite of ours who you’ve heard us talk about before, Chef Johannes, creates two new taco’s each week for all to try. His creativity in the kitchen, the flavors that he pairs together is fabulous, and we love his “I have an idea, let’s try it” approach to giving us a taco we’ve never tasted before. 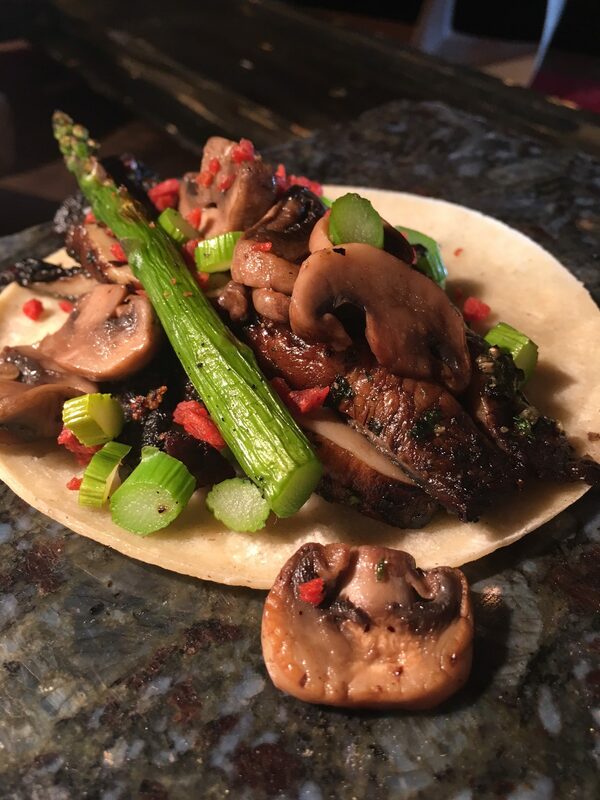 This week’s feature was a roasted Portobello, Cremini Mushroom and Asparagus with Vegan Bacon Bits all nestled a corn tortilla, known as The Shroom. It had a wonderful smoky flavor, and we enjoyed every bite. 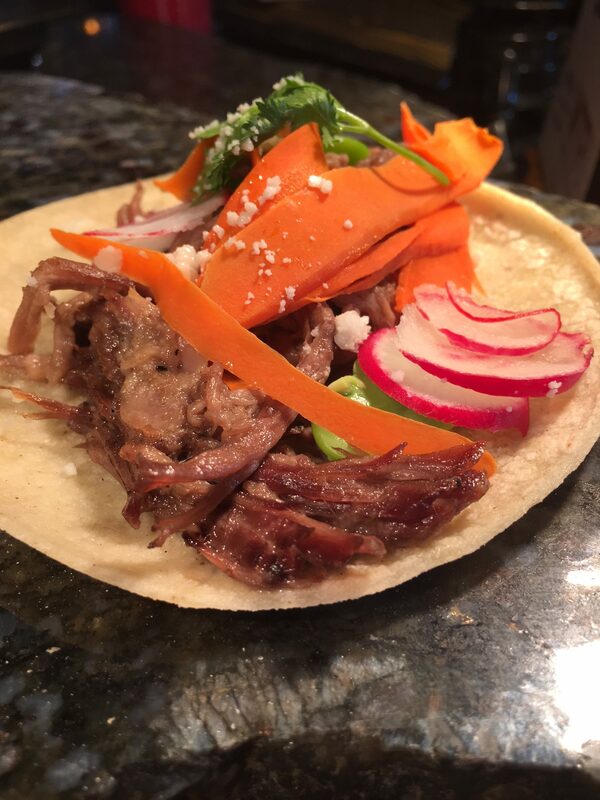 The second featured taco was The Silent Lamb; roasted Lamb, Fava Beans with an excellent Chianti reduction. This taco was amazing and the combination of flavors mouthwatering, and we love the playful titles for each taco. So many tacos to try as we paced ourselves and many more tacos to taste. What will we sample next? The Big Dripper looks like a breakfast taco and oh my, is it delicious! 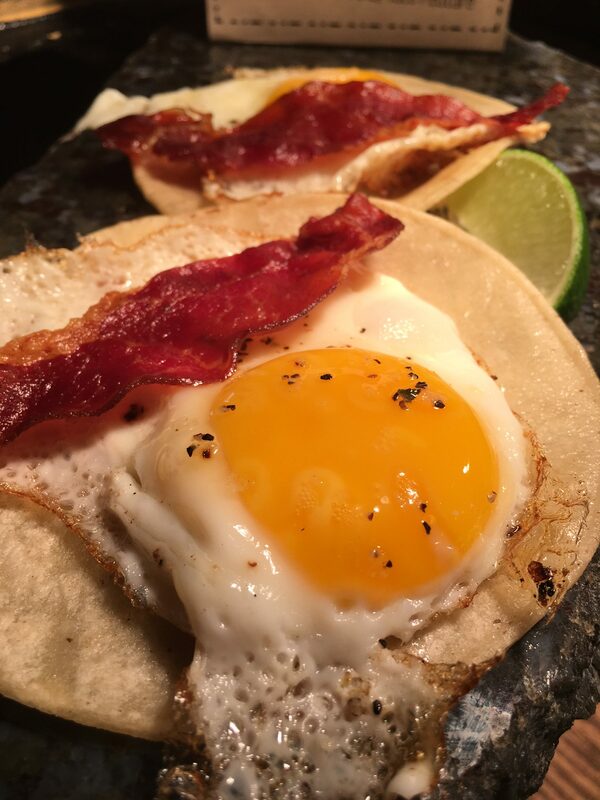 Take one corn tortilla with a seasoned sunny-side up Egg, top with Serrano Ham and Shaved Parmesan; a full flavor explosion! For those of you who like breakfast for dinner, this is your taco! You may also wish to try the Mahi Mahi Battered Fish Taco known as the Harpoons Fish Taco or the Shrimp Po’ Boy. All tacos are so different with special touches you will not find in a traditional taco. 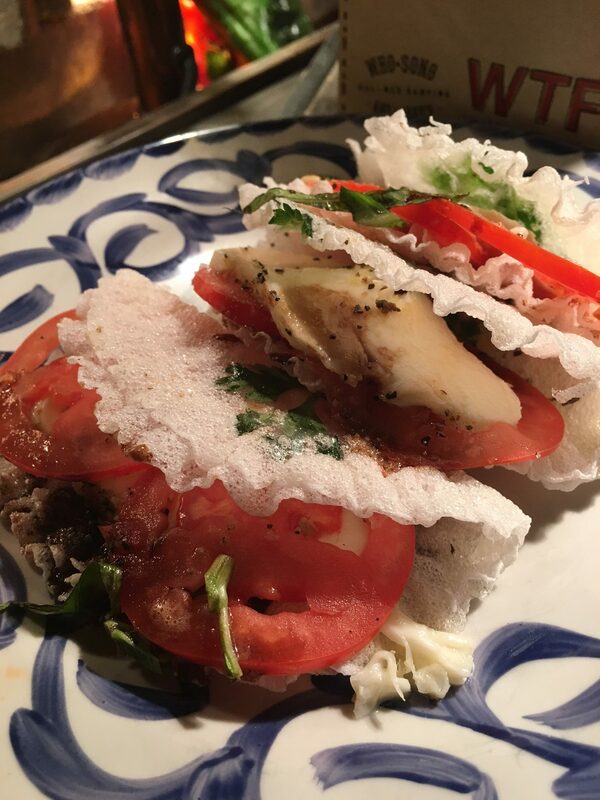 On the lighter side, we were treated to a Caprese Taco using those rice paper shells we love so much. Each filled with sliced Tomatoes, Mozzarella Cheese, Basil and drizzled with Balsamic. We could see having these for a gathering featuring appetizers in our home. Delish! Two great ones for you meat lovers, The Shorty. The dish comes with tender short ribs, which just fall apart and topped with Cotija Cheese, plantains, and Pico de Gallo. It was one of our other favorites; savory and sweet! We might need two of these! What they brought us next was true to its name, The Triple Threat! You gotta love the names, right? 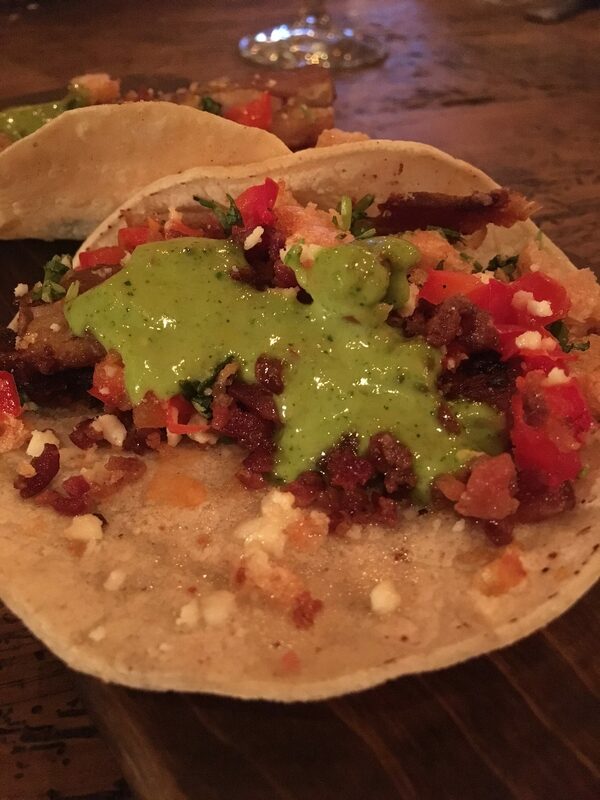 Now the Triple Threat was the perfect taco for any meat enthusiast; it’s full of Smoked Pork Belly, Crispy Candied Bacon, Chicharron with a Bing Cherry Chutney! It was by far the best way to end our tasting extravaganza! If you enjoy being adventurous and exploring, new flavors visit Who Song & Larry’s for the Weekly Taco Feature. It’s fun to see what Chef Johannes is going to share with us next; we can’t wait. If you see him, say hello from us too! Who Song & Larry’s is located in Orange, CA.